RVing Alabama was a great trip for us! We purchased our RV from a great gentleman in Birmingham. It was the start of our adventures in RVing! After spending some time in Louisiana during the winter months, we journeyed up towards the northeast. It was pretty neat to be back in Alabama again, and returning to our origin town of Birmingham. We had read about this really neat statue on top of a mountain in Birmingham, so we had to investigate it. Again, thanks to Roadside America, we found it. The statue is called "Vulcan" and sits on top of Red Mountain. 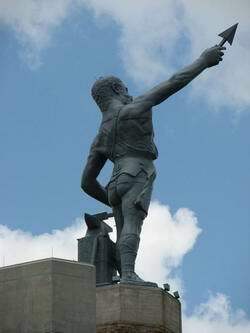 Vulcan the Iron Man is 56 feet tall with a very impressive physique - especially his buttocks! Seems this caused quite a bit of controversy within the citizens of Birmingham. 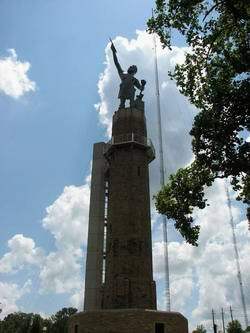 He was created in 1904 for the World's Fair in St Louis. Seems he was made from the iron ore out of Red Mountain at the "Sloss Furnaces". Because he wasn't wearing any pants, he wasn't allowed to return to downtown. Instead he was shipped to the State Fairgrounds, where he stayed until 1938. Then he was finally returned and mounted on a 12 story tower atop the mountain his ore came from - Red Mountain. By 1999, Vulcan himself was becoming worn out! He was removed and rebuilt so he could again be remounted on a newer pedestal for all to see. His return in 2004 was greeted by everyone seeing his buttocks from below, once again! The views of downtown Birmingham from "Red Mountain" and Vulcan are a great reason to be RVing Alabama. 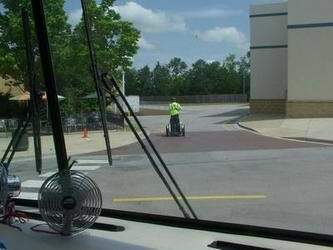 A great place to park your RV, if you have a toad, is a huge Mall at Exit 19 of I-459. It will be on the north side - heading towards Birmingham. Security personal on bicycles or Segways will show you where you can park. The Red Mountain and Vulcan are on quite a hill - no sense beating up your transmission of an RV! Turn right onto Summit Blvd and go several lights up the hill. At the crest area turn in and head towards the "Carmike 10 Cinema Complex". To the left of it is a small roadway to the back area - security will guide you there for "temporary parking". Do NOT try to park at the Cracker Barrel Restaurant on the south exit of 19 - too small a parking lot within a small mall area.